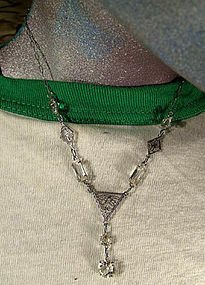 An Art Deco filigree cut crystal choker length necklace 1930. This rhodium plated necklace has a spring-ring catch, it measures 14" long, and it has a central 1-3/8" x 3/4" drop and round and rectangular claw-set open backed crystal stones. It is unsigned, and this necklace is in excellent original condition with no chips, cracks, dents, bends, corrosion, losses, damage or repairs. All items are thoroughly and conservatively graded and all condition issues are noted; all items are vintage or antique and may have slight signs of gentle use. Expedited tracked and insured parcel shipping to the U.S. starts at $19 (other spots may vary, air is higher). Items paid with a credit card will be shipped to confirmed addresses only. We do ship internationally. All of our prices are in $US. PLEASE NOTE: We DO NOT accept PayPal. 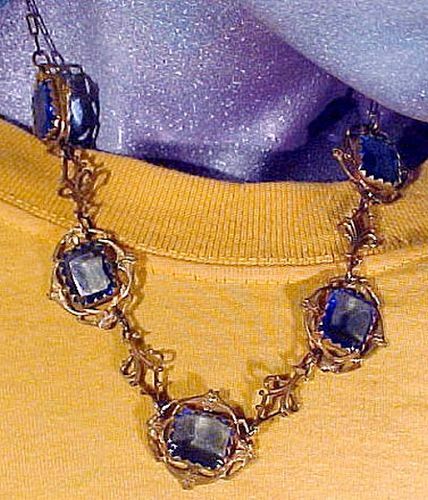 Art Nouveau gilt brass & blue crystal necklace 1910 1920. This necklace has unfoiled hand cut blue crystal stones and this stylish 16-3/4" necklace has a chain and springring catch with five 1" across links with openwork and embossed designs with 3/4" ornate links in between. It is in excellent original condition with no chips, cracks, scrapes, dents, monograms, bends, corrosion, losses, damage or repairs other than some very slight light scratches to the tops of the stones. All items are thoroughly and conservatively graded and all condition issues are noted. Expedited tracked insured air post starts at $18 (to the US - other spots may vary). All of our prices are in $US. PLEASE NOTE: We DO NOT accept Paypal.